You may have heard about teeth whitening and are considering using an at-home kit for just such a purpose. Dental bleaching is the most rapid way to have a brighter smile. The most effective method is to use peroxide based teeth whitening gel and bleaching trays. Well, understanding a little bit about how the fastest form of dental whitening works may help you make the best teeth whitening decision, for your situation. The peroxide in teeth whitening gel transforms into oxygen molecules. These molecules seep into the pores of your teeth demolish the stains that are trapped in them. Your teeth naturally have a bit of luster to them and stains dull that luster. When these stains are broken down, the once luminous quality of your teeth is then revealed. This can happen very quickly with peroxide teeth whitening gel. Many feel it is the best teeth whitening for the brief time factor, alone. This process can also whiten your teeth beyond their most natural white, but this may not be a good thing in all cases. You have to be careful when you use a gel and trays, dental bleaching system. You need to protect the soft surfaces of your mouth from the teeth whitening gel and you need to make sure not to leave the gel on your teeth longer than recommended. You must also not overuse your dental whitening system. Your precious tooth enamel can be damaged by overexposure to the peroxide gel. There can be soft surface damage to the other surfaces of your mouth by prolonged contact to the bleaching gel. This can happen with best teeth whitening system, if you misuse it. Imagine what havoc could ensue if you use a dental whitening kit, which contains inferior ingredients. That is where using an FDA approved, dental whitening system, such as the Impressive Smile 10 Minutes Teeth Whitening Kit is a wise decision. Many dentists consider this to be one of the best teeth whitening systems for at-home use. This is because the teeth whitening gel is able to safely give you a noticeably whiter smile in as little as 10 minutes. Your enamel will be protected by such short exposure to the peroxide gel. Many dentists sell this kit to their patients for their at-home use. Dental bleaching systems do not need FDA approval, since they are considered to be cosmetic. The Impressive Smile Kit instills confidence in its users by having gotten the FDA seal of approval. You will know that this dental bleaching system is safe and effective, thanks to that level of approval. 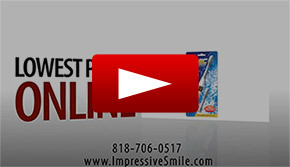 If you visit https://www.impressivesmile.com/, you can buy the Impressive Smile Kit for less. You can have one of the best teeth whitening systems on the market for a steal. You can have a beautifully bleached smile, through the use of a teeth whitening gel and dental trays. As long as you use it properly and have your dentist's “okay”, your smile should remain healthy and sparkle as it once did.